Today we are hitting 108. That record we broke yesterday is going to be smashed by the time this year is over. I will try not to complain too much more about it. Try being the important word. I am really trying not to be a Debbie downer and always talk about the weather but it effects everything. Want to go running? Okay but we have to go at 5:30am. It will still be mid 80’s with about 70% humidity. Electric bill? Here’s a hint…open the bill sitting down. My yard? Wow. We haven’t seen measurable rainfall in who knows how long. My yard is dead, our lake levels are 30+ feet low, and we are on severe water rations. Meaning we can only water one day a week. One. Want to go out to eat? Can’t sit outside. Want to go on a walk after dinner? We don’t drop below 100 degrees until close to 8:00pm and when I say below 100 degrees I mean we hit 99. Okay. I know. You. Get. It. I need to try harder not to talk about it. Let’s start over. Happy Thursday. That’s better, right? You know what I am going to do today? I am going to make one of my all time favorite sandwiches. 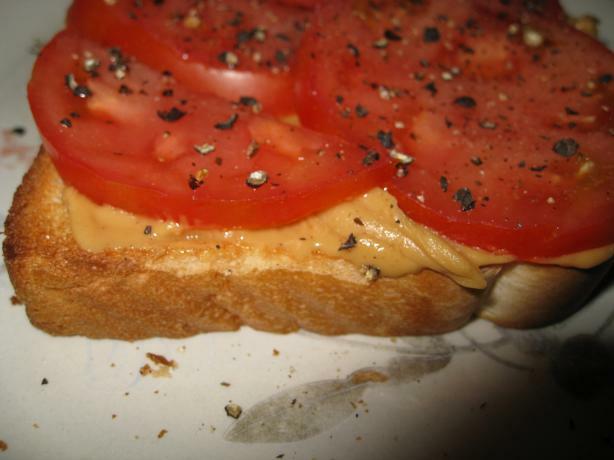 A Tomato and Peanut Butter Sandwich. Wait! Wait! Stop! It is reallllly good. I promise! Spread peanut butter on hot toast. Completely cover the toast with tomato slices. Sprinkle liberally with black pepper, and add just a bit of salt, if desired. Eat! I am already excited for lunch. But I won’t be eating outside. Do you have a weird sandwich combination that you swear by? I hear ya! 115 here yesterday, seriously. Going outside felt like a convection oven being left on. Our electric bill are on “auto pay” where they are the same all year. Totally necessary here in AZ, I am SO happy we have it this year! I am also grateful for our at home gym with elliptical, treadmill, spin bike, yoga room, you catch my drift. Not necessary to go outside (although it would be nice) for exercise. Your sandwich looks yummy, something quick and easy, no oven necessary, yes! My weird combo ( I am the queen of them), popcorn with protein powder sprinkled on top with a few chopped up pieces of Bakers Chocolate. Somehow I rationalize that the protein powder makes the snack more “healthy”. Meanwhile I get the “what the heck are you eating” look from my husband. Whatever, I like it! Stay cool! That is definitely an interesting sandwich combo! I’m not really into large tomatoes, the texture gets to me, but I am working on it! Baby steps. 😉 I don’t have any weird combos for sandwiches, but I have done the Wendy’s fries in a Frosty thing! Surprisingly good! That sounds… bizarre. I’m sorry about the weather, I hope it breaks soon! Also, I nearly had a heart attack when I opened our electric bill this month. HA! I am also a big fan of almond butter and swiss cheese sandwiches. I know. I am totally odd. Did you hear that Ben is going to be the next bachelor? Ugh. I was hoping for Ryan. Oh well. I always enjoy a peanut butter pickle sandwich…I love the saltiness! I love peanut butter more than most people, but I have to say I’m skeptical of this sandwich. This sandwich – no can do. Two great tastes just not meant to go together. But, weatherwise – totally with you. 100+ everyday is really cramping my training for Tough Mudder. Guess I’m not as tough as I thought. Enjoying your blog Kelly – way to go! Ok I have no idea if I’d like this sandwich or not. I can’t make my mind up about tomatoes — sometimes I really like them and sometimes I can’t stand them. The strangest sandwich I’ve made is a mashed banana/avocado sandwich which was surprisingly good! I hear you on the weather — we had a 2 weeks of 100+ degree days and it was horrible. I know what you mean about not being able to run outside, eat outside, etc. And you start sweating really badly as soon as you walk outside. I felt like I needed 20 showers per day. For some reason I couldn’t comment yesterday. You probably don’t want to know what the weather is like here anyway. That sandwich combo is crazy, but it may actually be good. I will definitely try it. Whhat?! Ok, I hate tomatoes so I’m probably biased, but that’s definitely up there with one of the craziest combos I’ve heard of. 😉 Although I’ve been known to eat same crazy things too. I know…but I also like almond butter and swiss cheese sandwiches! heh! hmm my mom would put mayo on toast for us when we were little. Oh and we would roll up cold cuts and dip them into ketchup. I have never even seen this combo before but I’m totally intrigued and need to try it! Yeah, you should definitely come to Boston. I actually didn’t want to get up in the middle of the night to pee, because I was in my warm comfy bed, and it was too chilly. (FYI: we don’t have air conditioning). I’m sorry about your weather! that would be so frustrating. Just think…fall is on the way!! Also, that sandwich has me interested. I would try it, but I don’t even like tomatoes. Maybe the addition of PB with them would change that? We’ll see…. Hi Kelly — I’m making a video for my Mom’s 95th birthday party. Can I use your photo of the peanut butter and tomato sandwich? That’s one of her favorites. In the video I have “www.whatkellysaid.com” in the lower right hand corner when that photo is on the screen. Hope that will be OK with you? It’s not for commercial use, just for our family.